For senior-year undergraduate and first-year graduate courses in robotics. 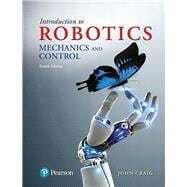 Since its original publication in 1986, Craig’s Introduction to Robotics: Mechanics and Control has been the leading textbook for teaching robotics at the university level. Blending traditional mechanical engineering material with computer science and control theoretical concepts, the text covers a range of topics, including rigid-body transformations, forward and inverse positional kinematics, velocities and Jacobians of linkages, dynamics, linear and non-linear control, force control methodologies, mechanical design aspects, and robotic programming. The 4th Edition features a balance of application and theory, introducing the science and engineering of mechanical manipulation--establishing and building on foundational understanding of mechanics, control theory, and computer science. With an emphasis on computational aspects of problems, the text aims to present material in a simple, intuitive way.